Not only the technology general division promoting R&D to develop innovative core technologies and new products, but also organizations responsible for the utilization of intellectual property rights, promotion of commercialization and reform of business processes in general are closely cooperating with each other to promote R&D flexibly. The Planning Division plans and promotes corporate technology strategies to strengthen and expand existing businesses and to create new businesses. 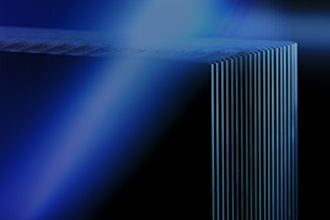 The division promotes open innovation including industry-academia collaboration and business-to-business cooperation and works as a contact point for technology-related questions from each company. 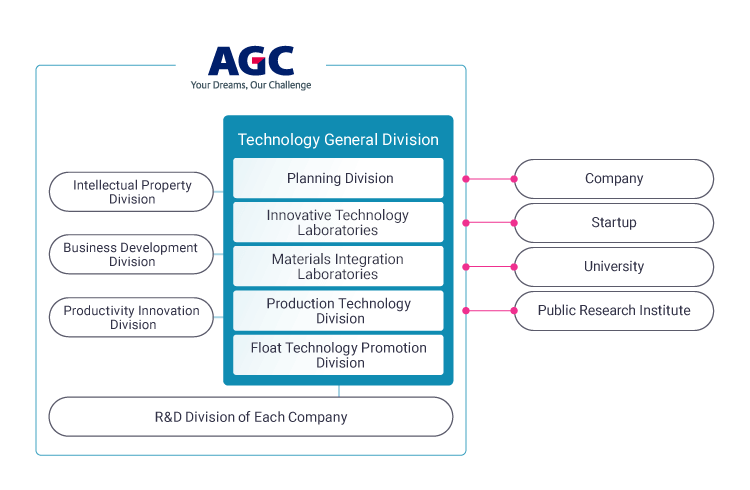 In addition, the division promotes company-wide development of technology and information caught up by AGC’s unique activities GTNET(Global Technology Networking) and proposes and implements policies and mechanisms. Innovative Technology Research Center is an organization that creates innovative basic technologies that support the AGC business over the long term. We have "Fellow Laboratory" with advanced expertise and "Common Infrastructure Technology Group" with advanced analytical technology and IT technology within the organization, and together with these advanced technology groups, the institute will have a long-term perspective on technology and market macro trends and develop "innovative production technology" along with that. The mission of the New Product R&D Center is to solve problems of existing businesses (short-term mission) and create new products incorporating diversity from the market perspective (medium and long-term mission), keeping them in good balance. By changing the organization structure from the conventional “technology-based” one to “market-based” and “outlet-based” type, technicians specialized in different fields carry out development while communicating across boundaries. The division actively promotes open innovation by positively engaging in technical collaboration through public invitation and exchange meetings with other companies. 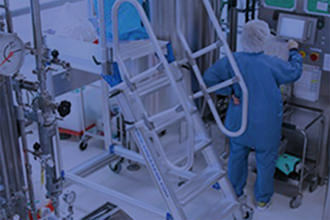 The Production Technology Division plays the role of designing, installing, and maintaining production facilities through research and development, solving problems and improving production technology, and supports the manufacturing technologies of AGC and Group companies. For this reason, the affiliated member's tasks range from research on the latest glass melting and molding technology to overseas plant start-up. In this way, by integrating process development and facility technology, the division works from the design and development stages, accelerating the realization of the latest technology development and competitive quality and cost. 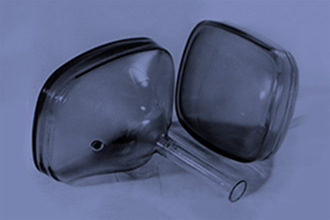 The Float Technology Promotion Division builds and supervises the platform of technology and know-how of "float process" which AGC has accumulated over many years and adopts in the flat glass manufacturing process. The division will further stabilize the process promoting its sophistication toward the future, as well as utilizing and training human resources from a company-wide perspective. The division also takes actions across the organization in anticipation of the realization of smart factories that make full use of ICT/AI technology. The Intellectual Property Division is an organization that acquires and utilizes intellectual property rights such as patent rights and trademark rights from intellectual assets created by corporate activities and promotes activities that lead to continuous business revenue. The division formulates and implements intellectual property strategies not only for traditional patent applications and rights, but also for securing business superiority, and to promote and develop standardization activities throughout the company in order to take initiatives in the industry. The Business Development Division is an organization that contributes to the continuous growth of AGC by proposing and promoting new businesses through creation activities ranging from marketing, incubation and business transfer to the company. In addition to working on expanding the promising materials from macro trends, the division also plays the role of planning commercialization of difficult projects which are difficult for the company or SBU to handle. 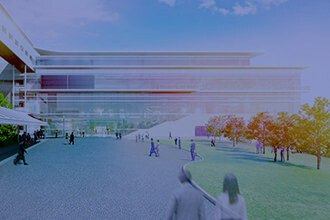 For that reason, the division not only cooperates with various organizations such as Building & Industrial Glass Company, Automotive Company, Electronics Company, Chemicals Company, AGC Ceramics and Technology General Division, but also proposes and promotes new businesses in cooperation with partners through such as MA, JV, JD, etc. outside the company. 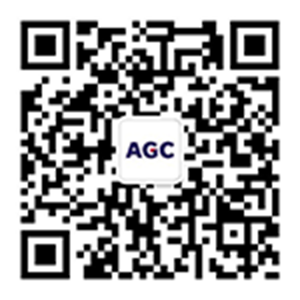 In addition to the activities in Japan, we conduct global new business development activities in collaboration with AGC Business Development America, AGC China, etc. The Productivity Innovation Division is an organization that promotes reform projects on all business processes across the business fields. While utilizing various business know-how, IT tools, IE, data science, etc., they support productivity innovation tailored to business needs such as improvement in productivity at the manufacturing site, building a supply chain management scheme, business design for sales marketing, supporting new mass production, exploring new partners, and reforming the way of work style.